Detective Stephen Lavender and Constable Ed Woods, of the Bow Street Magistrates' Court are summoned to Northumberland to solve the disappearance of a beautiful young heiress, Helen Carnaby, from her locked bedroom in a tower. The local residents have already decided it's witchcraft, the better to blame their favorite villains, the gypsies who reside in Hareshaw Woods. Neither the gypsies nor the servants at Linn Hagh, home of the Carnaby family, want to talk to the authorities. And there's something very odd about Helen's brother George Carnaby, and her sister Isabel Carnaby. They're hiding something, yet they seem genuinely baffled by Helen's disappearance. 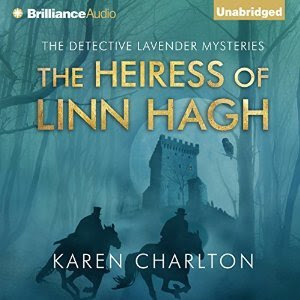 Gradually, Lavender and Woods work out that the problems at Linn Hagh go back well before Helen's disappearance on a cold October night, and madness, jealousy, and dark family secrets play a large role in whatever has happened here. The characters are good, complex, and interesting, and both Lavender and Woods are fully fleshed out, with lives beyond their jobs. Charlton and the narrator, Page, capture both the mutual support and the sometimes claustrophic nature of a rather isolated small town, and make the characters worth spending time with. The plot keeps moving, and there are some interesting twists and turns.